The Fitbit Versa and the Samsung Gear Sport have quite a few features in common and they both are aiming at competing head on with the Apple Watch. Since I own both of these watches, I’ve noticed many similarities between the two and some differences. Both are very good at being fitness trackers but for right now I’d have to give the edge to the Gear Sport for also being the better smartwatch since the Gear Sport’s app store has more to offer such as more popular apps like MapMyRun®, Endomondo®, and MyFitnessPal®. These apps can be downloaded onto the Gear Sport and extend the functionality of the watch. I hope these will be coming to the Versa too. Still, I like the Versa, even though there’s not many apps to choose from just yet. 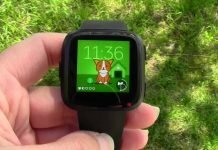 However, since the Versa has sold well since its’ release, there should be a lot of interest by third-party developers to create apps for the Fitbit OS platform that runs on both the Ionic and the Versa. I’m most interested in seeing what apps will be available for the Versa 6 months to a year from now. I think the potential is there to become a much more competitive smartwatch. 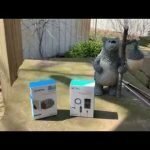 Although both watches had their quirky behavior at first, as brand new products usually do, both seem to be working those issues out. With the Gear Sport I was having problems with the built-in GPS at first but I haven’t had any issues since then. With the Versa I was having problems syncing the watch and keeping it connected to my phone by Bluetooth but I’m rarely having those issues now. Both watches support downloading music directly to them but it’s easier to transfer music onto the Gear Sport than the Versa. It can be done through the app with Samsung. With the Versa, you have to connect it to your computer and then transfer the files by Wifi and hope the Wifi connection is strong enough. This is something that Fitbit really needs to work on. Samsung’s method is much preferable. Both also support streaming music. With the Versa you have Pandora and Deezer and with the Gear Sport you have access to Spotify and some other streaming services. If you have a Samsung smartphone (or any Android phone) the Gear Sport is going to pair up with it very well. You’re going to get your notifications and be able to respond to them by voice or by using other options. That is a very handy feature that I use quite a bit. The Gear Sport is also compatible with the iPhone and most of the features will work fine but you won’t be able to respond to text messages. The same is true for the Versa’s quick replies to text messages that are currently only available for Android users. Fitbit is trying to work something out with Apple but Apple has a closed ecosystem when it comes to many of their products, so you’ll have to blame Apple. 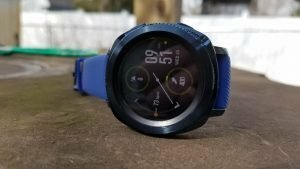 Both of the watches did very well in my step tracking tests so I think you’ll be fine with either but the Gear Sport does have a bit of an edge in this area because the Samsung Health app also counts steps, if you have that feature turned on in the app. A nice thing about the Gear Sport is that by both wearing the watch and having my phone in my pocket when I’m walking, the Samsung Health app will pick up those steps that the Gear Sport misses when I’m pushing a shopping cart, a stroller, etc. Missing steps when pushing a shopping cart is typical behavior of nearly all fitness trackers since most use arm movements to detect steps. However, those steps that the Gear Sport may miss are picked up by my phone and then added to my daily total in the Samsung Health app and the steps between the two aren’t duplicated, so you don’t have to worry about that. The app seems to be smart enough to know where the data is coming from and not produce inflated numbers. The Versa has its strong points though. It’s an extremely comfortable watch to wear being that it is so lightweight. I also love the color reproduction on the screen and just how readable it is in bright sunlight. I can see the Gear Sport in sunlight as well but the Versa is even brighter. I think both are attractive watches but that’s always a subjective thing. The Gear Sport is a heavier watch but it does have a nice premium feel to it. Both are also waterproof and can be worn swimming and will track pool swimming. 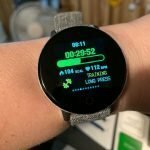 I especially like the watch faces made by Fitbit Labs, such as the one shown in the pictures on this page of the Versa. They’re fun and motivating and make the watch seem more interactive. Of course, Fitbit has a huge user community that you can participate with. It’s very easy to compete against friends, family members and co-workers through the app, although the Gear Sport supports this as well. Samsung just doesn’t have as large of a user base in regards to fitness tracking. 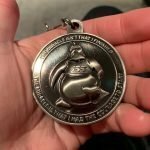 A lot of people have Fitbits! 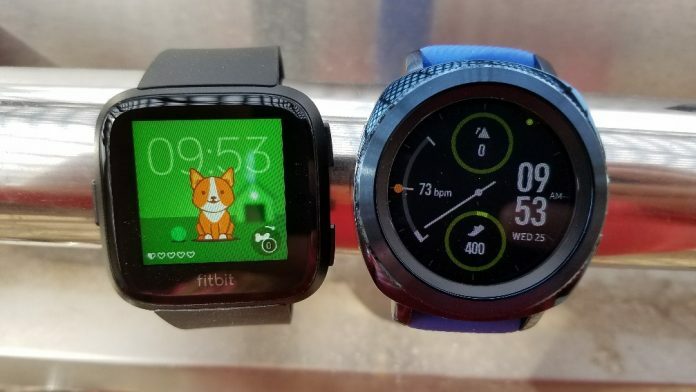 Both watches also support guided workouts, although I think Fitbit does it a bit better since 3 come installed on the watch and boy do they give you a workout. The Gear Sport is a tad more expensive than the Versa. 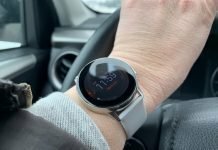 If you can catch the Gear Sport on sale, the price difference isn’t much, especially if you’re comparing it against the special edition Versa which supports NFC payments. 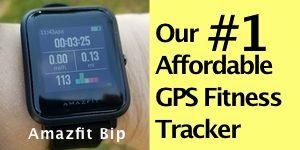 Probably the biggest feature that you should probably consider when comparing the two watches is how they handle GPS for your outdoor activities. 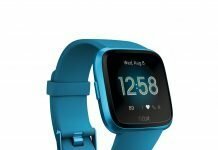 The Fitbit Versa uses connected GPS, meaning that you’ll need to carry your phone with you and the Versa will use the GPS on your phone to calculate distance. With the Gear Sport there are three different options for using GPS. You can use your phone’s GPS, both your phone and the Gear Sport’s built-in GPS, or just the built-in GPS on the Gear Sport. 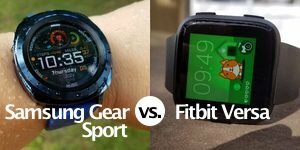 Below is a comparison table of the Fitbit Versa and the Samsung Gear Sport to help you decide which watch is right for you. 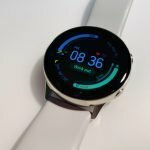 Lightweight, easy to use, colorful display that’s easy to see in sunlight, large Fitbit community, fun and motivating Fitbit Labs clock faces – I really love them! Connected GPS (requires the use of your phone’s GPS), no mic to reply by voice to text messages, buggy Bluetooth/WiFi connections and software at times. Transferring music is a bit of a pain. 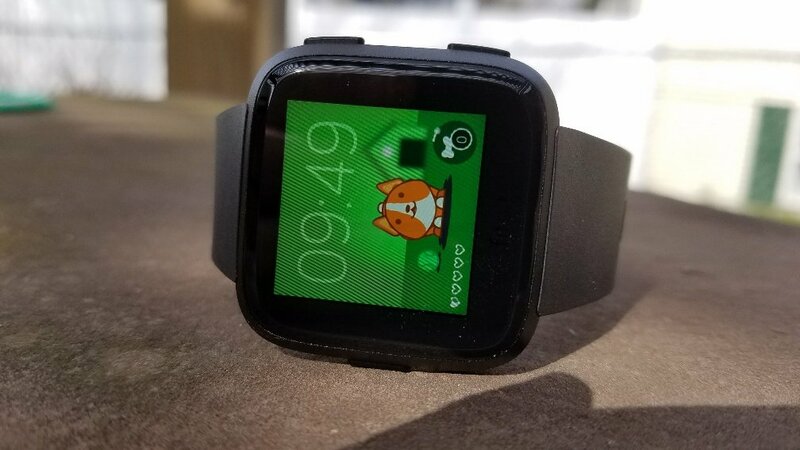 The Fitbit Versa is brand new on the market and some features aren’t yet enabled, like quick replies for text messages (Android only) and female health tracking. It may support measuring blood oxygen in the future but we’ll see. Fitbit is very good at developing easy to use products and the Versa is one of them. The only thing that needs major improvement is how music is transferred to the watch. The Versa also should have had built-in GPS but then what would the point of the Ionic be? Fitbit kinda shot themselves in the foot on this because the Versa should be the Fitbit watch with all the bells and whistles. I would have preferred a mic to reply to text messages too (like the Gear Sport has and the Pebble Time). Still, the Versa is a fun watch to use and as the app store grows, which I think it will, the watch is just going to get better. Of course, the Fitbit community is great for friends, co-workers, and families to compete and motivate one another. You can also join groups to share with. I particularly enjoy the hiking group since I love to hike. The Fitbit OS which runs on the Versa and Ionic still has bugs to work out. Syncing issues can occur and receiving notifications isn’t always reliable. The Samsung Gear Sport is a very capable fitness tracker with built-in GPS and that cool rotating bezel. It’s not just cool but practical too. 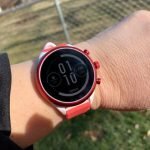 I particularly like using MapMyRun with the Gear Sport so I can see where I am on a map and track back my path if I need too.